Specifications for an equipment enclosure can lead to an overwhelming number of options. This new checklist is designed to walk you through all the necessary steps for designing and buying a custom enclosure. It's quick and easy and the whole list is only a few pages long. Check off what you need and take notes as you follow the steps. You'll find details and instructions for what to do for each of these sections. 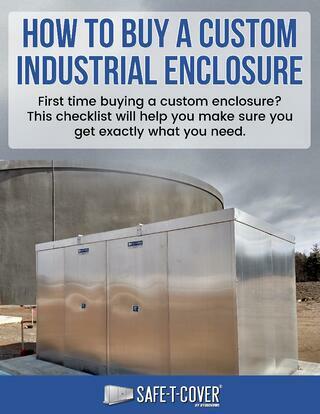 This checklist is designed to give you an actionable process to follow for the best enclosure design for your project. You may find there are more options than you initially thought, or realize your initial choices are missing something. The custom enclosure design checklist is one more way Safe-T-Cover is trying to ensure custmers get exactly what they want. Too often stock solutions force engineers into compromising on enclosure design.. But we’re engineers and we understand each project is an engineering challenge in addition to a series of commercial considerations - we want to help engineers understand the range of options they have, and how to design ideal custom enclosures. Maintenance and engineering teams are going to live with the consequences of an enclosure decision, good or bad, for a decade or more. Traditionally project managers have had to settle for an adequate solution to keep a project on schedule and on budget. That’s not the case any more. Custom industrial enclosures are feasible for a wide range of applications - quickly and affordably. After all, so much attention goes into the application - isn’t it important to protect it as well as you design it?